Poynting XPOL-6-10M antenna not designed for LTE-A? Also, when I go to Network Settings, I can see it's connected over 2300MHz yet when I manually select it using that interface, I lose connectivity. I'm paying Telkom for LTE-A. I don't see why I should have to use a third party tool to get the most out of the service. Wow great LTE-A speed there. I assume you are on a capped product? Might be worth investigating taking over a R599 uncapped contract. Works on LTE-A and with those speeds you would really enjoy it. Also since you are on a capped you can look @ the 500GB night surfer addon if you need to do a lot of downloads or updates. At that speed you should be rocking come midnight. Also just want to give you and everyone else here some clarity on Telkom band 40 and LTE-A. Okay so Telkom is running their LTE-A network on band 40 (2300MHz) Now to get LTE-A/4G+ they run two blocks of 20MHz spectrum in band 40. Now as everyone know that B315 and obviously other can connect to band 40 but does not do carrier aggregation. SO what happens is the router connects only to one of those 20MHz spectrum blocks at a time but it can actually connect to either not both at the same time. If that makes sense. The reason @OP saw speeds slow on the first time is that one band 40 is relatively fast ~70Mbps and the other one relatively slow @ ~18Mbps but both is band 40 but from different parts in that band. Now when LTE-A/4G+ comes into play you combine those two bands into one data stream. Hence the 90Mbps+ speedtest. So each LTE-A site of Telkom basically running 2 x 2300MHz signals if I can put it in easy terms. Non LTE-A/4G+ router will connect to one at a time where LTE-A/4G+ routers will connect to both at the same time aka aggregate both carriers to give speeds of both. ^^Ta cavedog, some useful info there. I wonder why the modem was not hitting the LTE-A modes automatically and why selecting the 2300 MHz setting through the default B618-65d UI was killing the connection? This is surely something of a technical issue from Telkom's side. I'm happy that I have been able to set it manually using the command-line tool (I'm about to do some packet capture to see what's happening over the wire when I run the app)... but surely it shouldn't be necessary. 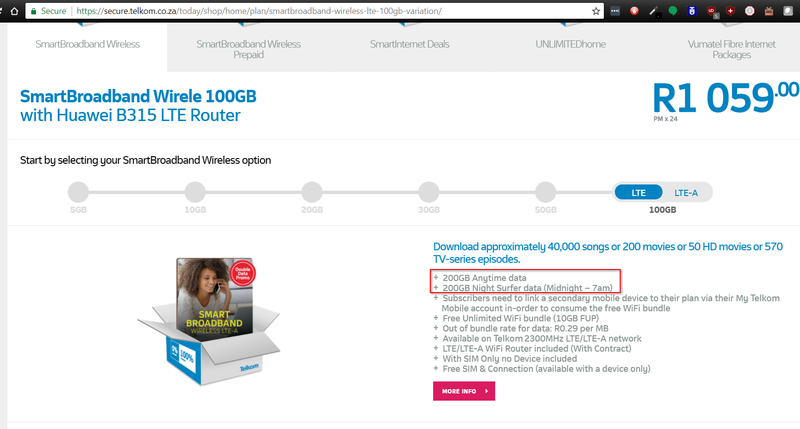 So I assume that I can confirm that the 4G+ on the modem's front page is confirmation that I'm getting the most from my package? 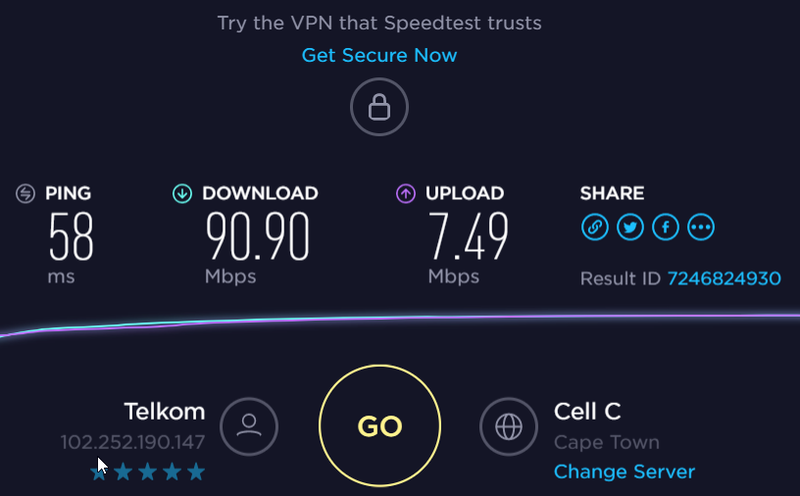 I am on capped - R1100 for 200Gb + 200Gb. I will certainly consider the R50 for 500Gb when the kids are home. My issue with uncapped is the FUP. I almost always hit the 200Gb daytime cap every month... and months when the kids are home from varsity we have to schedule their downloads after hours. You are most certainly getting the most out of your package. Those speeds would not have been possible without a LTE-A router so you are doing pretty good. If it's on auto the Huawei routers like to connect to 1800MHz band even if it's a LTE-A router in LTE-A coverage. I always recommend to manually tune and adjust to get the best speeds as 1800MHz might have better signal stats it's rarely faster than 2300MHz or LTE-A on 2300MHz. As for the uncapped LTE it comes with a 300GB FUP policy so it already has 100GB more than what you are getting now and it's cheaper. Unfortunately I have just signed up for this on a 2 year contract. I'll just be happy with what I have for now and see if I can switch at the end (hopefully I'll have Fibre as an option by then lol). Thanks a ton for the help!! Do you know anyone wanting to get rid of their LTE uncapped package? Thanks. Maybe the person I spoke to was uninformed. Will call them Monday. I see there is LTE and LTE A package available. If my tower is not LTE A ready, will it just drop down to LTE? If you take a look at the map basically all 2300MHz LTE sites are LTE-A now so very good chance you will be on LTE-A if you have Telkom LTE-A coverage. That said yes it will. The reason the LTE-A price per month is slightly more is because you get the B618 router. PRemium router retailing for ~R5000 so I would recommend it even if you don't have LTE-A coverage. If you take the LTE-A deal it will work on any technology lower like LTE only on all Telkoms bands, 3G and 2G. Thanks for the info cavedog. how do i know if its a genuine xpol 6 or not? Short of opening it, you don't, but chances are it's not going to be a copy - it's just not worth going to that effort IMO. Check the branding on the antenna - it's an SA brand, so it's unlikely Chinese counterfeiters will copy them. The bigger concern is whether the seller is legit or trying to scam you. I have a Xpol 6 antenna available for sale in the classifieds section if anyone is interested. I did not get those great download speeds while on Telkom LTE-A. It makes a huge difference. B315 does not support LTE-A. B5186 and B618 do support Carrier Aggregation or LTE-A. the B618 uses 4x4 Mimo on the internal antenna's, possibly why you get better speeds instead of using the TS-9's connections. the router if on auto will only choose 1800 if the signal is too weak on 2300 gHz. 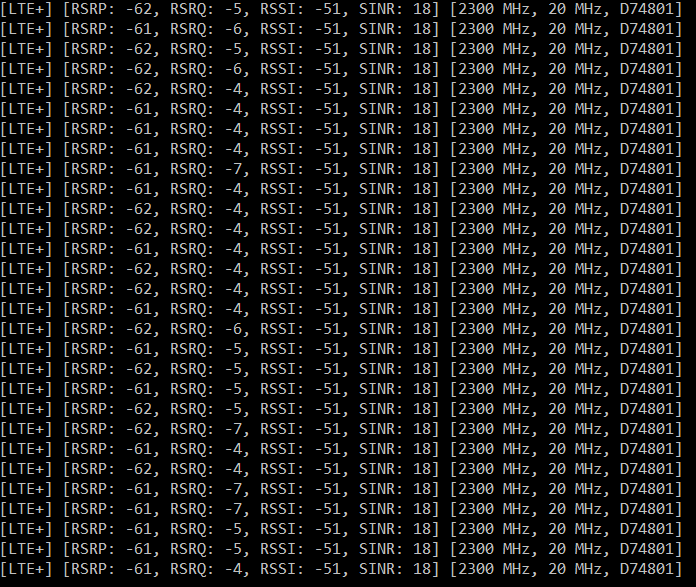 not all sites have 2300 gHz. LTE-A is only supported in the 2300 gHz. Telkom Contract LTE-A. I'm 800m away from Tower. I did some more tests this morning. Strange but true, i jump between Cell_ID:. Using "LTE Watch" and i switch to LTE-A within the tool it sets the router to 4G in Network Setting. Then Random my Cell_ID switches to Cell_ID:5700102 this one also does not give you 4G+. This what speed test revealed. For Info only. This is a Telkom LTE contract. Currently overcast and we had some thunder showers during the night. Any Suggestion to why? this is happening.